T's Mods including ExpandedCloth, ExpandedCrops, MiscStuff, MoreBeds, MoreFloors, and RawCropThoughts. Compatible with RimWorld 1.0. Updates T's Mods from 2.0.0 to 2.0.1. 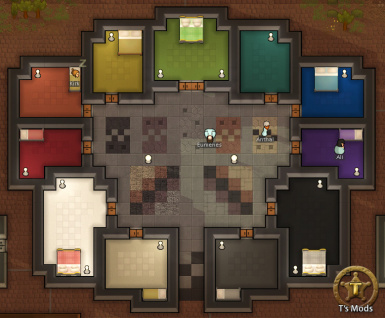 T's ExpandedCloth for RimWorld alpha 14. 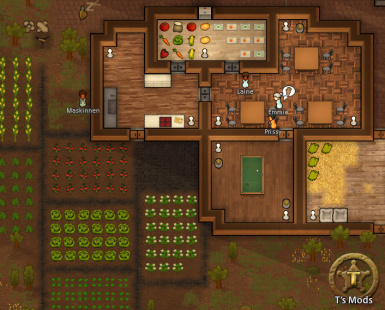 T's ExpandedCrops for RimWorld alpha 14. Compatibility version of ExpandedCrops designed to integrate smoothly with dismar's Vegetable Garden mod. T's Mods including ExpandedCloth, ExpandedCrops, MiscStuff, MoreBeds, MoreFloors, and RawCropThoughts. Compatible with Rimworld Alpha 17. T's Mods including ExpandedCrops, CoreCropTweaks, ExpandedCloth, Terraforming, MoreFloors, MoreBeds, ConditionRed and MiscStuff. Compatible with Rimworld Alpha 13. T's Mods including ExpandedCrops, ExpandedCloth, MoreFloors, MoreBeds, and MiscStuff. Compatible with Rimworld Alpha 15. T's Mods including ExpandedCloth, ExpandedCrops, MiscStuff, MoreBeds, MoreFloors, and RawCropThoughts. Compatible with Rimworld Alpha 16. T's Mods including ExpandedCrops, CoreCropTweaks, ExpandedCloth, MoreFloors, MoreBeds, ConditionRed and MiscStuff. Compatible with Rimworld Alpha 9. 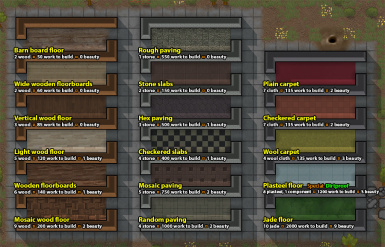 T's Mods including ExpandedCrops, CoreCropTweaks, ExpandedCloth, MoreFloors, MoreBeds, ConditionRed and MiscStuff. Compatible with Rimworld Alpha 10. T's Mods including ExpandedCrops, CoreCropTweaks, ExpandedCloth, MoreFloors, MoreBeds, ConditionRed and MiscStuff. Compatible with Rimworld Alpha 11. T's Mods including ExpandedCrops, CoreCropTweaks, ExpandedCloth, MoreFloors, MoreBeds, ConditionRed and MiscStuff. Compatible with Rimworld Alpha 12. Updates T's Mods to 1.13.1. Updates any previous version of T's Mods to 1.13.2. T's MoreBedsCloth for RimWorld alpha 14. Compatibility version of MoreBedsCloth that allows Anonemous2's More Furniture mod to affect added beds. T's MoreBedsVanilla for RimWorld alpha 14. Compatibility version of MoreBedsVanilla that allows Anonemous2's More Furniture mod to affect added beds. 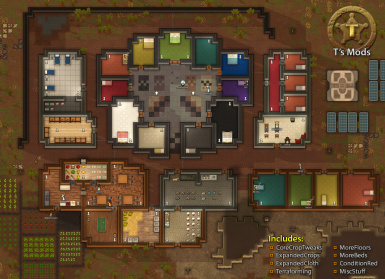 T's MoreFloors for RimWorld alpha 14. Compatibility version of [T] MoreFloors designed for use together with Igabod's Fast Floors mod. Compatible with Rimworld Alpha 13. Compatibility version of [T] MoreFloors designed for use together with Igabod's Fast Floors mod. Compatible with Rimworld Alpha 9 and 10. Compatibility version of [T] MoreFloors designed for use together with Igabod's Fast Floors mod. Compatible with Rimworld Alpha 11. Compatibility version of [T] MoreFloors designed for use together with Igabod's Fast Floors mod. Compatible with Rimworld Alpha 12. T's Mods including ExpandedCloth, ExpandedCrops, MiscStuff, MoreBeds, MoreFloors, and RawCropThoughts. Compatible with RimWorld Beta 18. T's Mods including ExpandedCloth, ExpandedCrops, MiscStuff, MoreBeds, MoreFloors, and RawCropThoughts. Compatible with RimWorld Beta 19. Updates T's Mods to 1.17.2. Updates T's Mods to 1.18.2. Fixes an oversight with [T] MoreFloors where the added floors used "light" terrain affordance instead of "heavy" as vanilla now does. No more cheesy terraforming! Updates T's Mods to 1.18.3. Fixes added beds in [T] MoreBeds so that they have the correct linkable facilities on them (dressers and end tables now work; vitals monitors won't). Compatibility versions of ExpandedCrops and ExpandedCloth designed for use with Vas's Hydroponics.